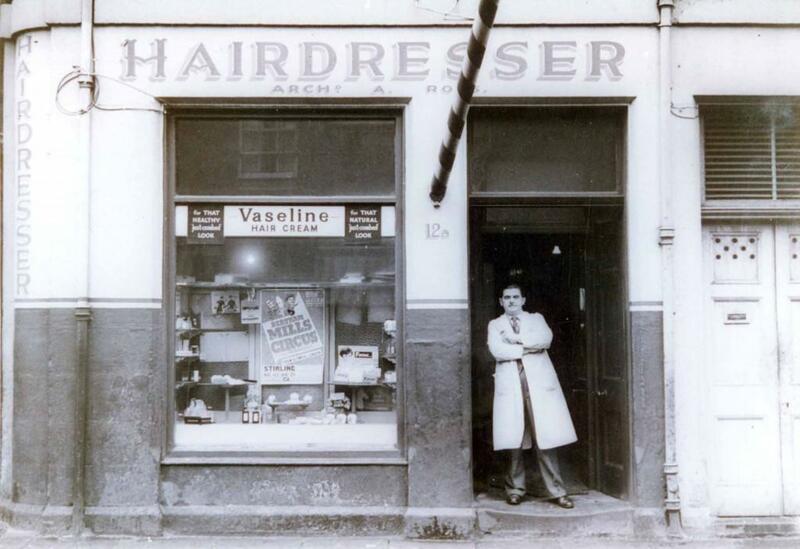 Today’s story shows a Stirling Hairdresser of an earlier era. The salon of Archibald A. Ross was at 12A Upper Craigs (at present, The Trophy Centre) from 1930-1961. This photograph of the late 1950s, shows his son Archibald B.E. Ross, at the shop doorway. The window has a good range of hairdressing products and a poster for Bertram Mills’ Circus, appearing in Kings Park. Note the barber’s pole on the shop wall. Such signs were of 16th century origin, when barbers and surgeons belonged to the same profession, and the pole symbolised a bleeding, bandaged arm. Although this pole disappeared in 1961, when Mr Ross lost the lease of the shop and went to work in Glasgow, other artefacts from the business have been donated to the Stirling Smith Art Gallery and Museum. These include an electrolysis machine, for stimulating the scalp to prevent hair loss, a hairdryer, clippers, scissors and razors, and a fearsome hand held electrically powered brush for cleaning shoes, gifted by his son Ewan Ross.